It is now a year and half since Japanese companies started to ‘comply or explain’ with Japan’s first corporate governance code – a milestone, which was reached less than 18 months after I formally proposed the code to the ruling party’s growth strategy committee. Moreover, additional reforms are on the way. On the one hand, this rapid progression reflects the continuing clear commitment of the government to reforming corporate governance in Japan in order to increase profitability at Japanese companies. On the other hand, in practice companies and investors alike are having trouble keeping up with the pace of the recent reforms. As the Asian Corporate Governance Association and CLSA so aptly wrote, now ‘the hard work begins’. The good news is that Japan’s corporate governance code set a base that can be improved upon and has given a firm foothold to the aspirational concept of ‘best practices’ in Japan. This by itself is historic, especially when you consider that some of the practices were totally new here. For instance, after I proposed the concept to the Financial Services Agency, a Japanese word had to be invented for ‘lead independent director’. Similarly, at the time, few here would have understood what was meant by ‘executive sessions’ or ‘board evaluation’. About 80 per cent of companies listed on the first level of the Tokyo Stock Exchange (TSE1) now have two or more independent directors (INEDs) on their boards, according to ascertainable criteria for ‘independence’. This is almost four times the percentage recorded only two years ago. At almost 23 per cent of TSE1-listed firms, INEDs make up one-third or more of the board. Approximately 40 per cent of TSE1 companies now have a voluntary ‘nominations committee’ of some form, a level which is eight times as high as it was 2014. Voluntary compensation committees are also increasing in number. is because the code not only requires ‘comply or explain’ statements, but also (irrespective of that) disclosure about each company’s policy on 11 different topics. Even when such disclosure is shoddy, at least one can confirm that those companies lack rigor and substance. Investors now have so much to shoot darts at that my organisation has constructed a special search engine. Most Japanese companies are more open to engagement by investors than before, a trend that is supported by the stewardship code. The ecosystem is improving. A potential virtuous circle is taking root. Better governance is now recognised as a core national policy – something that is essential for Japan’s future. There is increasing scrutiny from the media and the public. At the same time, votes against the re-election of CEOs at firms with low return on equity or governance mishaps are increasing. In Japan’s shame-based society, where executives hate to be in the news unless it is about something positive, these are powerful forces. For instance, the nine companies in the TOPIX 500 where the CEO’s re-election was approved by less than 80 per cent in 2015, found a way to improve their return on equity by an average of 2.4 per cent in 2016 (when fully 26 firms received less than an 80 per cent vote for CEO re-election). Investors are starting to vote for results and companies are starting to react. But inside corporate boardrooms there is still a lot to fix. Unless both the government and investors take further steps, I fear that rigorous commitment to true practice ‘substance’ will be elusive and the reforms may lose their momentum. 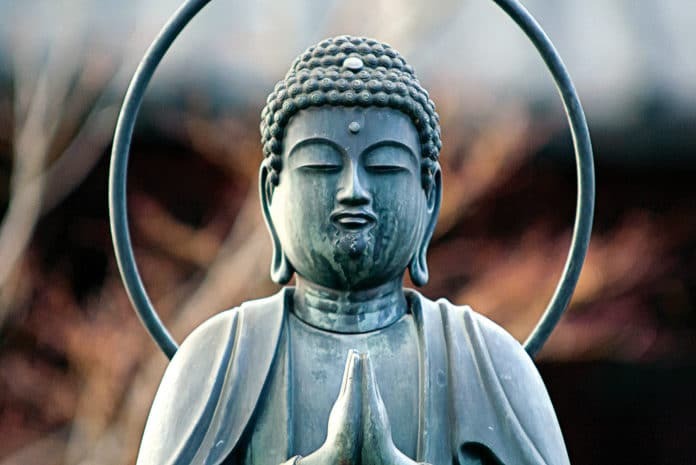 In Japan, the expression ‘making a statue of Buddha without instilling his spirit’ is used to stress the importance of sincere dedication to substance rather than just going through the motions. The expression fits in this case. The reforms were put in place so fast that companies need more time to understand what the principles of the code require in terms of detailed practices and mindset. 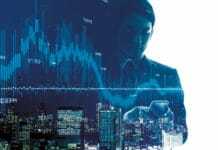 At the same time, investors also need to learn how to leverage the code’s principles, by considering with experts how its principles can be reflected in granular procedures in the context of Japanese law and telling companies exactly what they expect. There’s actually a lot to mine in the code. Simply put, a lot of learning and practice refinement needs to take place, on both sides of the investment equation. That is the reason why my own organisation, which focusses on governance-related training, is becoming much becoming busier. But in my own view, given where Japan has come from and the number of listed companies, we are not nearly busy enough! The diagram below describes what is going on within many Japanese companies. As expected, there are a small number of true ‘leaders’ and a lot of relative ‘laggards’. The former are setting examples for the latter to follow. Organisational change at the ‘substance’ level takes time and at a good number of companies, internal discussion, training and practice enhancements are still moving forward. But at too many other firms, the internal discussion and improvement process slowed to a near stop after the rush of the first year, in the absence of specific practice improvements requested in detail and on paper by investors. In other words, ‘we must have done enough, since no one is complaining much’. Companies need clear guidance and to see a hint of a stick. This means that investors need to prioritise key sections of the code, suggest detailed practices and criteria focussing on them, set forth a polite warning that proxy voting will reflect the results and then (after a year or so) vote against the re-election of senior executives who do not respond sufficiently. This is not to say that all companies will resist meaningful change unless absolutely forced. Refining practices that do not exist at most firms yet would take time even without resistance. 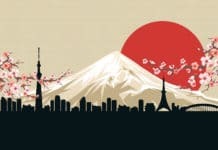 One also has to understand that to some extent, Japan’s governance code is inevitably vague in certain key areas – it is far less ‘prescriptive’ than the UK code – because it had to cope with three different corporate legal frameworks for board governance. 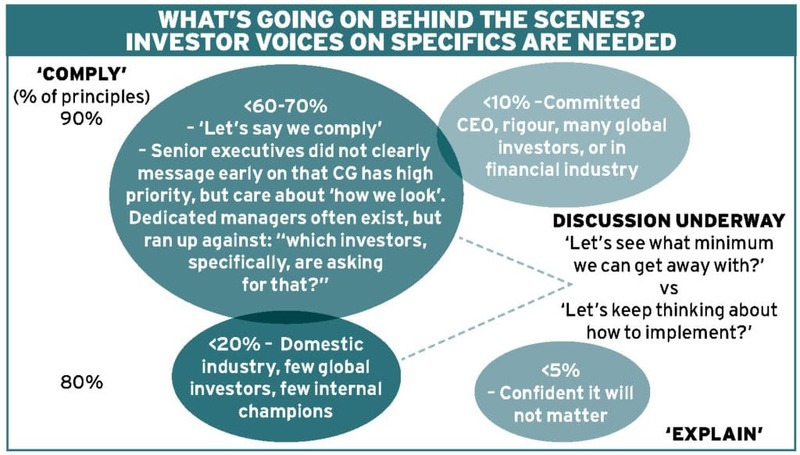 It will take time for investors and companies to reach consensus about the unstated details. Reflecting those lessons learned will be the task of the revision of the code, which will probably occur in 2018. The fact that many companies have formed such committees even though they are only mentioned as a voluntary practice by the code is progress. But now it is time for investors to: a) shame the companies that do not have them, while b) requiring all members to be independent and for the committees to use forward-looking needs matrices that reflect strategic needs, rather than seniority, loyalty to the CEO, or congeniality driven by the desire to be re-nominated. Based on that average reality, in ‘education-obsessed Japan’, you would think that executive skill-building and director training would be no-brainers – especially since the code itself requires director training both before election and on a continuing basis. Yet far too many of the companies who say they ‘comply’ with this principle of the code, say they do so not by actually training anyone, but by ‘explaining board resolutions to outside directors before board meetings’, ‘giving tours of our facilities and teaching outside directors about our strategy’, or (in better companies) ‘offering directors the [unutilised] opportunity to receive training if needed’. And it is almost never clear who is accountable for the so-called ‘policy’, so briefly described. Shareholders need to call their bluff. In a country where 80 per cent of directors are ‘promoted’ internally, sending director candidates to an external training programme in advance of asking shareholders to vote for them only requires senior management to order that it is done. Since almost none of those candidates have prior board experience when first appointed, that is the least the company can do if it is asking investors to elect them. 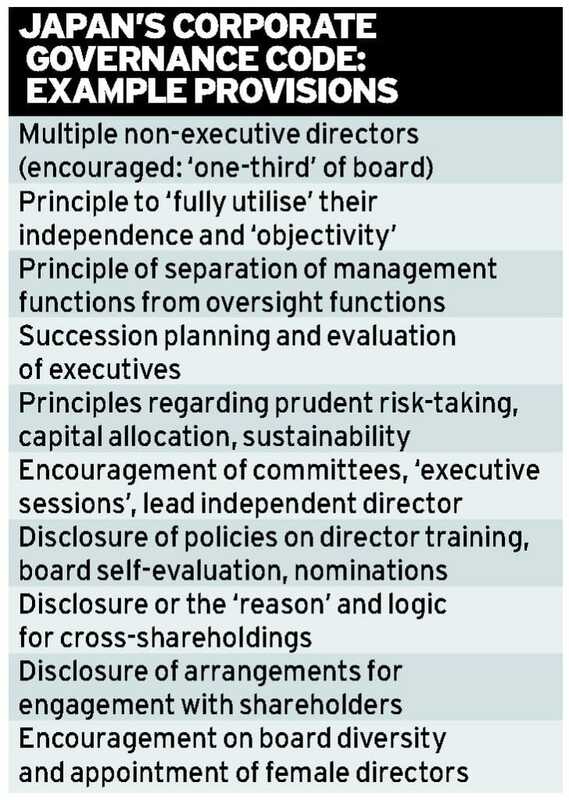 Clearly, this ‘80 per cent of directors’ is the group that controls the board – not the independent directors. Yet global proxy advisors follow domestic practice by automatically approving almost all new internal candidates with no screening criteria whatever. Investors deserve far better than this. The government is moving forward on several fronts where I have made detailed proposals. Together with the corporate governance consultancy ISS, it is questioning the custom of appointing retired directors to cushy ‘advisory’ positions. 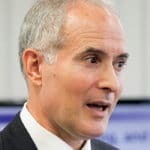 It is moving to amend regulations so as to encourage corporate pensions to sign the stewardship code, inasmuch as only one non-financial pension plan has done so. And it is focussing on the need for more effective nominations committees. If shareholders ask for the right specifics, good Japanese companies will now be in listening mode. How can you tell a ‘good’ company from one of lesser quality? It is one that trains its executives about governance and finance before asking shareholders to vote for them. Mr. Benes is representative director of the The Board Director Training Institute of Japan (BDTI), a “public interest” non-profit certified by the Japanese government. A lawyer and MBA who worked as an investment banker at JP Morgan and then led his own M&A advisory boutique, Mr. Benes has served on a number of Japanese boards. He has also advised the Japanese government as a member of various government committees. In 2013, he proposed that the creation of a corporate governance code be included in the Japanese government’s growth strategy, to be implemented under the auspices of the Financial Services Agency (FSA). He then advised members of the diet and the FSA, with regard to the drafting process and the content of Japan’s first corporate governance code. Previous articleWhistleblower: A hero, a villain or simply a fool?